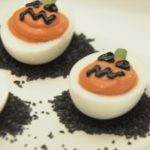 From Halloween jello shots to yummy dips and desserts, there are several creative ways to throw a great Halloween bash. 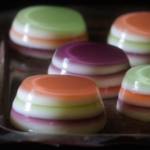 If you will be serving alcohol at your party then these jello shots are sure to be a hit. They look fancy but are surprisingly easy to make with just vodka and a few additional ingredients. 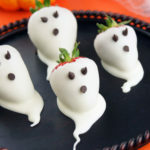 These strawberry ghosts are a fun alternative to chocolate covered strawberries. Not only are these delectable treats elegant enough for your adult themed party, they also add a touch of whimsical to keep with your Halloween themed party. Another nice thing about these tasty ghost treats is you need just three ingredients! They are also really easy to make. Deviled eggs make a great appetizer and are so easy to make. To create these fun, pumpkin inspired deviled eggs you just need to add some simple coloring to this basic deviled egg recipe. A little bit of green onion is also used to make the pumpkin stem. 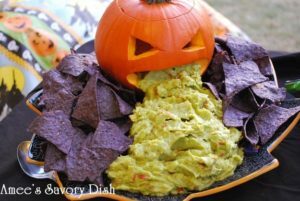 This isn’t a recipe but rather a funny and creative way to serve guacamole at your party shared by Ameessavorydish.com. 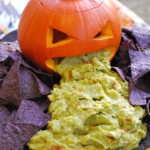 All you need is your favorite guacamole recipe (or buy some already prepared), a carved pumpkin and some blue tortilla chips for a simple yet delicious Halloween themed dip. October and pumpkins just go together. And even though canned pumpkins is available year round, it seems that most of us crave anything with pumpkin once that crisp autumn weather arrives. 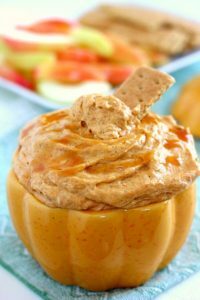 This apple pumpkin cheesecake dip is delicious and takes just a few simple ingredients. You can serve with a variety of snacks such as graham crackers, pretzels and/or apples for a tasty dessert dip that everyone will love. Layered dips are popular any time of the year and this 7 layer dip is no exception. Here is a video from Six Sister’s Stuff that shows how easy this is to put together. If you are throwing a Halloween themed party then don’t stress out about having every single item on your menu fit into your Halloween theme. You can simply create a few fun Halloween recipes and round out the party menu with popular party recipes like crock pot pulled pork, a delicious spiced cider punch and maybe a nice veggie tray with an assortment of dips to add to your Halloween appetizers. Either way your guests are sure to enjoy a nice variety of options for a delicious party menu. And don’t forget to include some fun Halloween music to really set the tone for your party. If you are planning a Halloween party for kids then be sure to check out these Halloween party recipes for kids that they are sure to enjoy.